Sismotrain - ZineWiki - the history and culture of zines, independent media and the small press. 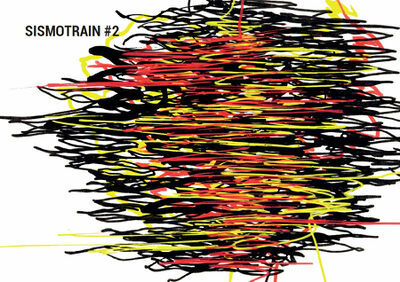 Sismotrain is an artzine published by French zinester Melayne_Seitoung. It contains sismographs realized by the author while travelling, using his body as a medium to record the oscillations and tremors induced by the unlevelled topography of Earth surface and landforms. Issue 1 (2016): 8 pages, format A5 (15*21 cm), black and white xerox, 25 copies + 5 artist copies, signed and hand-numbered, with original sismograph drawn on page 2. Issue 2 (2016): 16 pages, format A5 (15*21 cm), 4-colour numerical printing, 40 copies + 10 artist copies, signed and hand-numbered, with original sismograph drawn on page 2. Issue 3 (2017): 26 pages, format 20*25 cm, 4-colour laser printing, 20 copies, signed and hand-numbered. Issue 4 (2018): 36 pages, format 20*25 cm, 4-colour laser printing, 75 copies, 25 are signed and hand-numbered with an original sismotrain on a train ticket. This page was last modified on 12 December 2018, at 06:50.